​"Get out of here, you low-life scum,” Sen. John McCain (R-Arizona) said to demonstrators who interrupted a congressional hearing in Washington on Thursday. Former Secretary of State Henry Kissinger was scheduled to speak at the hearing. C-SPAN was broadcasting the morning hearing of the United States Senate Armed Services Committee, chaired by McCain, and caught the senior lawmaker live on camera as he verbally unloaded on protesters from the DC-based group Code Pink. Kissinger, who is best known for his role in the administration of President Richard Nixon during the height of the Vietnam War, encountered jeers from the protesters as soon as he entered the Senate chamber. "Arrest Henry Kissinger for war crimes!" activists chanted as the statesman walked before the committee and took a seat alongside the hearing’s other witnesses: former Secretaries of State Madeline Albright and George Shultz. All three were in attendance to testify at a hearing concerning global challenges as they apply to US national security strategy. At least seven members of Code Pink were at the hearing and promptly ordered out by McCain as they unfurled protest signs. "Could someone find out where the Capitol Police is?" the committee chair said. As the melee subsided, McCain addressed the incident by saying, "I've been a member of this committee for many years, and I've never seen anything as disgraceful and outrageous and despicable as the last demonstration." What's really disgraceful is @SenJohnMcCain welcoming murdering liar Kissinger to Senate hearing as if he had any ethical credibility. 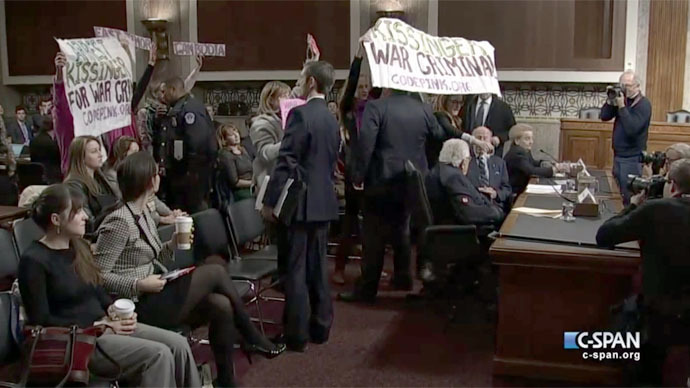 Two days earlier, Code Pink protesters werekicked outof a Senate Committee on Finance hearing after they interrupted proceedings to speak up against a proposed trade agreement that activists say is being negotiated in secret. “The First Amendment guarantees your right to express your views, but we have to allow civil discussion to occur in the context of this hearing,” Sen. Orrin G. Hatch (R-Utah), the chairman of that committee, said during Tuesday’s hearing.